A place to talk about any topic on your mind (non-broadcasting related). General conversation. 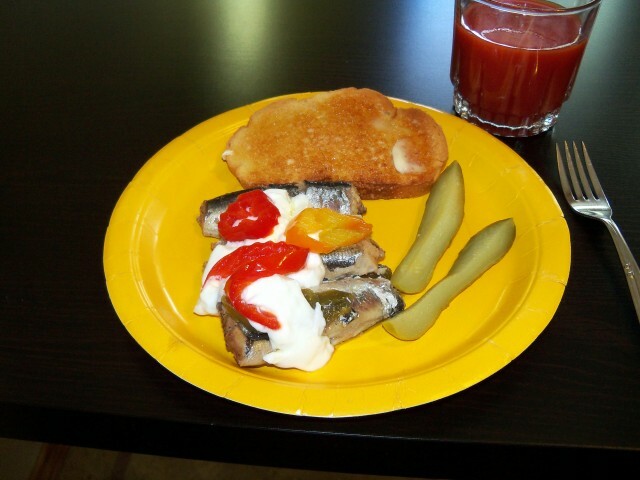 Toast, sardines with a dollop of sour cream and hot peppers, dill pickle, V8 juice. LOL, Pink. I feel sory for anyone's toilet. Is there a toilet anywhere that you envy? Toilet has to be the worst gig in the house. I'd rather be the coffee maker. I would rather be a cookie jar. It's not an appliance technically, but it's the best thing in the the kitchen(in my opinion anyway). A cookie jar usually comes in the form of some adorable character from pop culture or another cute or beautiful design. It holds a food that is not only unbelievably delicious, but also transcends every demographic. Everyone loves cookies. Every home should have a cookie jar. If I were a cookie jar, I would be the cutest Winnie The Pooh cookie jar and would be full of warm, gooey chocolate chip or M&M cookies or yummy, soft, frosted Lofthouse style cookies. 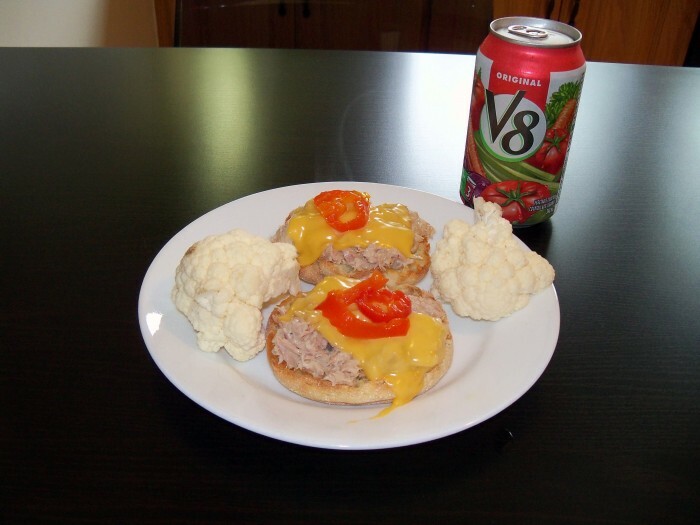 Today's lunch, Tuna Melt with cauliflower and V8 juice. Are you trying to win us over to the Canadian cuisine or keep us from wanting to visit. I have to tell you, it might work if it weren't for Tim Horton. © 2019 TC Talks ltd. 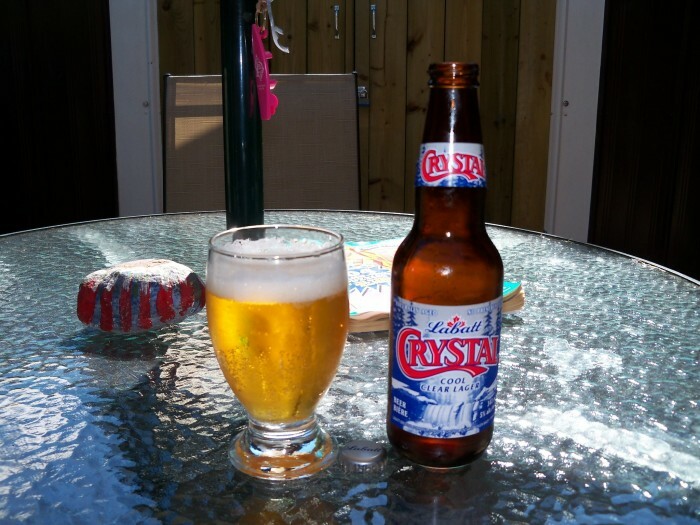 Assembled in U.S.A.
Labatt Crystal Lager. Made right here in London, but very little is sold here. Only a few of the Beer Stores stock it and I don't know of any bars here that sell it. Isn't much demand for it around here. Up north, where we used to live, it was a very popular brand. It had an almost cult-like following, especially with the guys in the Union. So I bought some this week for old times sake. Four of my old friends of the cult are no longer around. One died of a heart attack. Another committed suicide. One returned to Scotland. The fourth, so I've heard, is in jail for something. I don't believe that any of these outcomes were related to the beer. But, then again, maybe they all were. I have a bushel of Michigan-grown Honeycrisp apples that are making my kitchen smell so yummy right now. When I bite into one, it's like fresh apple cider(not the hard kind). Galas are the variety of choice here ever since they were introduced. They seem to stay firm forever, even when cut up and air-dried in a dish! Galas are great too. I don't have a favorite kind of apple. I love them all. I buy whatever smells fragrant in the store because that is what will taste the best. MY preference is to buy them from an orchard or farmer's market, but I don't really get that option. The husband driving me around, taking time out of his day makes the choices. I was out on assignment in Louisiana for three weeks. Got home last week and boom 6 days later I find myself in the great state of Texas for two more. Eating in restaurants get old after a while and I find myself dinning in my hotel room to be a welcome change on occasion. This is what I call a "Turkeytop Special". New York extra sharp cheddar cheese with Ritz crackers. and most importantly a 25.4 oz can of Fosters. Total cost with beverage, 6.95. Made out pretty good on the per diem tonight! There sure isn't as much excitement, fawning, or adulation over our first orange president as there was over our first black one. Evidently, orange really isn't the new black. That actually looks fairly appetizing. 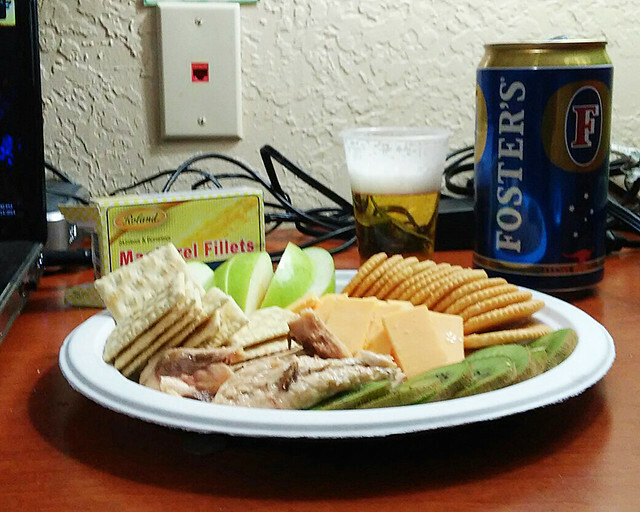 Of course, I like cheese and crackers anyway. Have since I was a kid. And crackers with spinach dip is good, as is salmon spread.